After their highly successful duet tracks, Inez Foxx’s brother Charlie settled in Mobile, AL with his then wife Hattie and they started their own record label Tee Off. Several 45s were released, all of them pretty hard to get now. 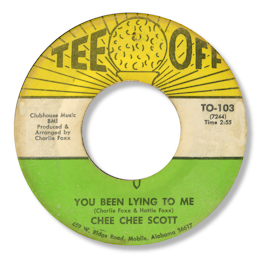 The James Kingston is good southern soul but the pick of the singles are the two by Chee Chee Scott, with all sides penned by the new Foxx partnership. The fact that three of the four cuts were recorded at the Hi Studios only adds to their quality. The first of them couples the beat ballad I Can’t Turn You Loose with the excellent slowie Straighten Up I Ain’t Lying. On both of them Chee Chee sounds really good, with a firm tone, great phrasing and nice gospel touches. Her second 45 has another goody in You Been Lying To Me which features some lovely bluesy guitar from Teeny Hodges and that loping rhythm that the Hi studios specialised in. The playing of Hi Rhythm throughout the sessions is absolutely impeccable – as are the Memphis Horns. If you like Ann Peebles- and who doesn’t – you’ll love Chee Chee Scott. The fourth track “Talking” is easily the weakest of them all – and of course it’s the one cut away from Hi. Thanks to Keith Glass for help and info.